The annual Carnival was a much-loved feature of Devonport life in the period between the wars, around 1920 to 1940. In those days it was sponsored every year by the Royal Albert Hospital, and the events took place over a full week. While several carnival-type events took place in Devonport prior to that time, all succcessful and documented, they are perhaps better described as one-off 'processions' and I've written about them elsewhere. Gerald Barker (Days in Devonport, Part II, page 5) wrote a short paragraph on this year's carnival. It was just a few lines and mentioned that the carnival queen was 17 year old Miss Laura Oldham. All that I know of the 1935 carnival stems from this programme cover page that I obtained from Ebay. Going by the title across the top, the silver jubilee of King George V was being celebrated at the same time. The carnival date is given as 18 August 1935 and there is mention of a special part of the hospital grounds being enclosed for the event. 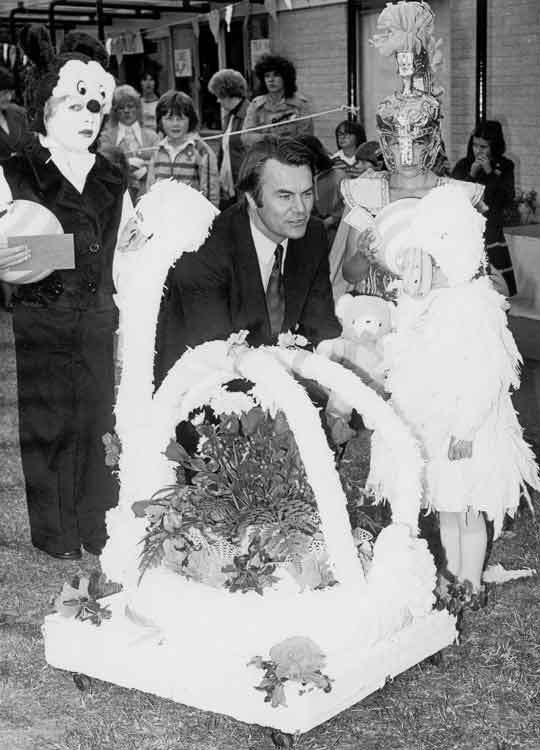 Also, this particular carnival held a religious service that was conducted by prebendary TC Walters, MA. Gerald Barker (Days in Devonport, Part II) uses the first three pages of his book in describing the 1939 carnival. It lasted a week, from August 19 to 26, with the opening ceremony taking place on the Monday, in Devonport Park. The procession (the carnival queen and her entourage) took place on the Tuesday. By today's standards it travelled a long way; having left the Royal Albert Hospital the route went first down to Pembroke Street, then over 'halfpenny' bridge into Stonehouse. The procession continued up past Wyndham square, down to Millbridge, then along to Alma Road at Pennycomequick; Pennycomequick being one of the boundaries of Devonport prior to the 3-towns amalgamation 25 years earlier. But that wasn't the end of the journey, the route continued up to Stoke Village and then back down to Devonport. Even there it didn't stop at Fore Street, it wove in and out of several Devonport streets before passing though King Street and ending at Morice Square. Quite a journey. And that was just on the Tuesday. Two days later the procession set off again, this time the route took in Marlborough Street and Fore Street, travelled up to Stoke village and Milehouse, then turned left down to St Levan Road, returning home via Morice Town and Albert Road, with the final destination being Devonport Park. An amazing two-day journey, covering large parts of the old Devonport. Residents clearly felt very attached to the town, even though 25 years had passed since it merged with Plymouth. In fact, they appeared to want the procession to cover the entire area of the old Devonport, which is exactly what they attempted, because on the Friday the carnival queen and her entourage set off yet again. This last leg covered Swilly, Weston Mill then Lower and Higher St Budeaux. They covered almost everywhere in one week - reaching out to most of the boundaries of the old town of Devonport (all excepting the Pennycross boundary). The carnival in the pre-war years was certainly a huge part of the Devonport calendar and culture, huge. Funding in those days wasn't provided, it was earned; in contrast to the millennium carnivals in Devonport, see below, where the committee fortunately received government NDC funds every year. Little is known of this period (by me) except that two or three carnivals did take place during the 1950s, and that Marlene Nix was the carnival queen on one of those years. Several of Devonport's older residents mention and recall her. There is a photograph around of Marlene but I haven't been able to obtain a copy. However, I am acquainted with her in-law Dianne, and Dianne informs me that Marlene married her (Dianne's) cousin Maurice and is now living in Perth, Western Australia. 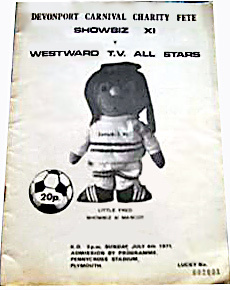 The 1971 carnival formed part of a charity fete and included a football match between the Showbiz XI and Westward Television All-Stars; this took place at Pennycross Stadium on 4th July 1971. Apart from the programme cover shown in the image below, little more is known about the event. If readers have any information, about this or any other Devonport Carnival, it would be good to hear from you. This was an extremely well-organised carnival. A carnival-revival committee had been formed in 1970, and now, by 1973, they had become very efficient. With little money, bar what they could raise by advertising and the usual community fund-raising efforts, they managed to plan to the 'nth detail events and activites to cover an entire week - such was the passion of the local community in those days. Devonport resident (then and now) Winnie Parsons was on the committee of the 1973 carnival; Win kindly gave me the programme and several photographs for that year. She said, "As soon as one carnival was over committe members would meet regularly at the Griffin Club (the building that is now called Leander House, in Fore Street) and plan ahead for the following year's event. Lots of fund raising would be carried out throughout the year, as there was no funding available from any source, there was no money given to you, not like today." Winnie (8th person in the dance photo) stresses that it was strongly a period of self help. "You either went and did it, or it never got done." She recalls how "Georgie Bray was sheer fun" (5th person in the dance photo). Her memories of then are of it "just being the happiest of times". She said "The day of the Carnival itself, all the floats would start off from the College at Kings Road, snake through all the Devonport roads out and back again. It would take all day. In the evening a dance would be held at the TownHall." 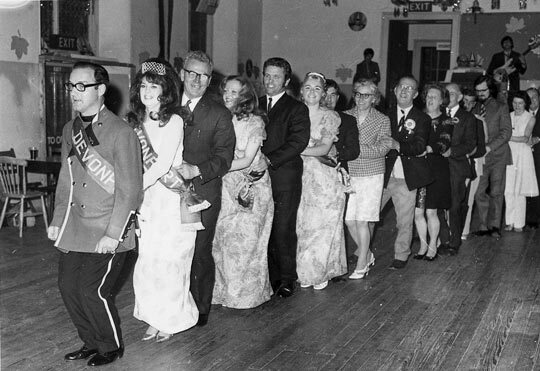 Photo: Dancing in Devonport Town Hall (Guildhall), during the 1973 carnival. Persons in the photo are the carnival king and queen, their attendants and several committee members. Please note: According to Winnie, the carnival king (1st in the photo) is Rex Mutton and the queen (2nd) is Sandra Bradbury, with attendants Karen Jones (4th) and unknown (6th). However, in the programme, the king and queen's names are written as George Broadhurst and Joy Hambley, and the attendants as Freda Parsons and Deborah Cook (therefore, those particular names are to be clarified). I can verify that George Bray is the 5th and Winnie Parsons is 8th as I know them personally. 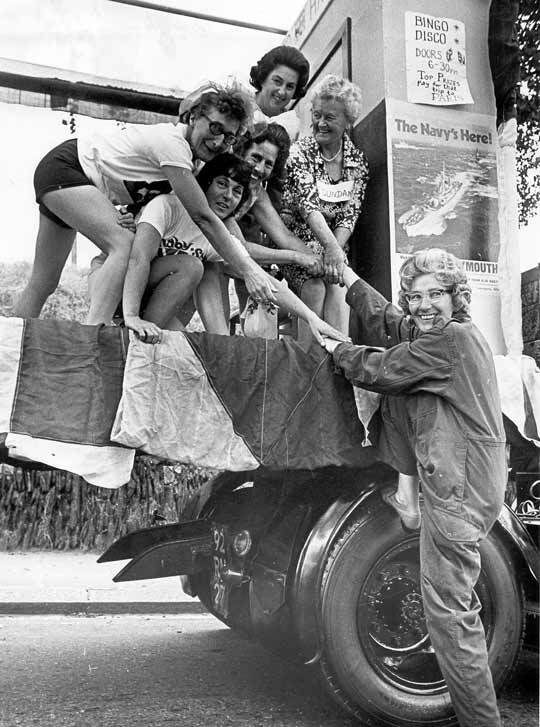 Winnie recalled, "In the'70s Devonport carnival was alive and kicking with as many as 58 floats taking the five-mile route around Devonport from Kings Road after their inspection by the Lord Mayor. It was a wonderful sight. There was a separate fancy dress section for the children; visiting queens and attendants followed the Devonport Royal Party in procession. The floats were mainly lorries and cars; it was well organised, with support being supplied by the police and St John Ambulance, and street marshals ensured all went smoothly. There were also at least three visiting bands. Today, however the price of petrol, high insurance etc. makes it hard to get a loan for the lorries for floats. The carnival at Devonport took one year to prepare and events spread over one week." Photo: Winnie climbing aboard one of the carnival floats, early 1970s. Procession Marshall. W. Taylor, Esq. CARNIVAL PROCESSION. Leaving at Kings Road. All floats must be assembled at Kings Road at 1.30 pm. Judging commences at 2.00 pm. ROUTE. via Devonport Hill, Chapel Street, Park Avenue, Albert Road, Molesworth Road, Osborne Villas Garfield Terrace, Devonport Road, Fore Street, Raglan Barracks. The Children’s Fancy Dress to be judged at Granby Community Centre. Entries will be accepted up till 1.30 pm. All entrants for the Fancy Dress must be assembled by 2.00 pm. Bowls at Devonport park 6.15 pm. To be held at Devonport Guildhall in the afternoon. Comic Footbal match at 6.30 pm. Hairstyles by Rosalind of Marlborough St.
CHILDREN’S SING SONG & ENTERTAINMENT. 2.00 pm - 4.00 pm. Dancing to the Jack Clark Trio	7.30 pm until midnight. Souvenir copies of two carnival programmes are available from Devon Council Council local studies. For 1974 here is the Devon County Council link and for 1990 the link is here. Between 2001 and 2011 a government project took place, whereby £48.7 million pounds was provided in order to Regenerate a large part of Devonport - this was the New Deals for Community (NDC) programme. 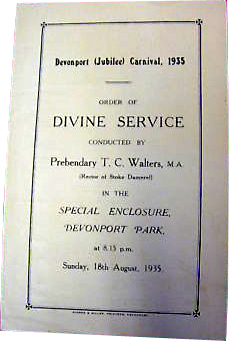 Renaissance of the Devonport Carnival was a key component of the NDC Culture Strategy - as mentioned in chapter five of the regeneration document called Devonport People's Dreams. In July of 2001 Will Blagdon, of Blagdon's Boatyard, Richmond Walk, together with a community team, was responsible for organising a very successful carnival/Fun Day. Following this, Fun Days were funded every year during the millennium decade, from NDC Funds under its culture strategy. Will and his team continued to organise the Devonport Fun Day throughout the ten years of the NDC project, and, generally taking place at Brickfields, it was always succesful and well-attended. However, an actual carnival/procession event, as part of the procedures, only took place a couple of times - it didn't take place on all ten years of the NDC Fun Days. The Friends of Devonport Park celebrated completion of the £5.3 million restoration project, with an official reopening of the Park on 4th September 2011. The celebrations included a procession that started from the Guildhall, in recognition of the first procession from the guildhall when the park was new, back in 1894. 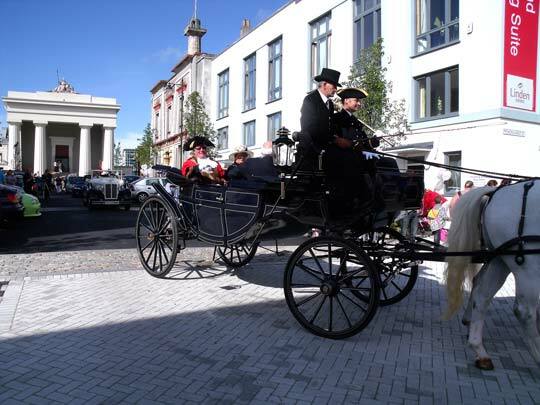 Photo: Lord & Lady Mayoress, in the 2011 procession leaving the Guildhall in Ker Street. The Friends of Devonport Park would like to be the key group taking the Devonport Carnival forward into the future, but given the current economy it will depend on funds.